AHA-MK is a forum of organisations that work together to position the arts and heritage sectors as strategic contributors to the community and economy. Leading our members, we work in partnership to take advantage of the unique landscape of Milton Keynes and its growth agenda – looking towards a thriving and internationally renowned creative future for Milton Keynes. AHA-MK champions the rich heritage and creative future of Milton Keynes through activities that inspire greater cultural ambition and aspiration, and which nurture cultural development. Our core values are to work collaboratively to represent, promote and develop our members, and to provide the cultural leadership that will make a major contribution to the celebration of the 50th anniversary of Milton Keynes in 2017 and to a bid for European Capital of Culture 2023. 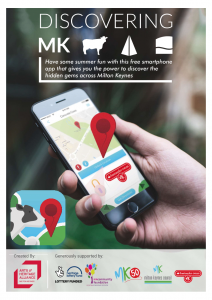 This project has been developed specifically for MK50: Celebrating 50 years of Milton Keynes, to promote the fantastic hidden landmarks and heritage that tell the story of our unique New Town. AHA-MK is a registered charity (number 1158874).